The son of hook-handed hate preacher Abu Hamza has had his British passport taken from him, leaving him stranded in Syria. 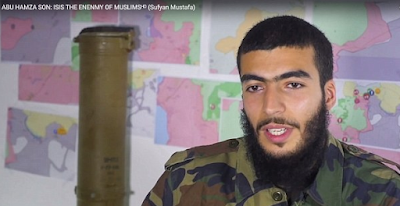 Sufiyan Mustafa, 22, left the UK to fight with jihadists in 2013 after his father was jailed in the US for terrorist offences. But after he left, the Home Office stripped him of his identification, meaning he can no longer return home. He told an Arabic newspaper he has appealed to be allowed back into the UK, according to the Telegraph. He has now spoken to a newspaper – al-Quds newspaper, saying ‘Britain is the place where I was born and lived. Earlier this month, Abu Hamza’s youngest son appeared in a propaganda video denouncing ISIS and the actions of Assad’s government. In a YouTube video he is also seen reciting verses of the Qu’ran. He is the sixth of eight children fathered by Hamza, who is serving a life-sentence in prison in Colorado.